Kick off your visit on the 10th (Sun): admire the natural beauty at Los Jardines de Mandor and then contemplate the long history of Santuario Historico de Machu Picchu. To see maps and tourist information, refer to the Machu Picchu day trip planner . Houston, USA to Machu Picchu is an approximately 23-hour combination of flight and car. You'll lose 1 hour traveling from Houston to Machu Picchu due to the time zone difference. Wrap up your sightseeing on the 10th (Sun) to allow time to travel to Cusco. On the 11th (Mon), look for gifts at Pedazo de Arte, then get in on the family fun at Manu Wildlife Peru, and then delve into the distant past at Sacsayhuaman. Keep things going the next day: admire the landmark architecture of Centro Historico De Cusco, admire the masterpieces at Pre-Columbian Art Museum, and then steep yourself in history at Plaza de Armas. To see reviews, traveler tips, photos, and more tourist information, use the Cusco trip planning app . You can do a combination of train and bus from Machu Picchu to Cusco in 3 hours. Other options are to drive; or take a bus. In March, daytime highs in Cusco are 68°F, while nighttime lows are 46°F. Wrap up your sightseeing on the 12th (Tue) to allow time to travel to Arequipa. 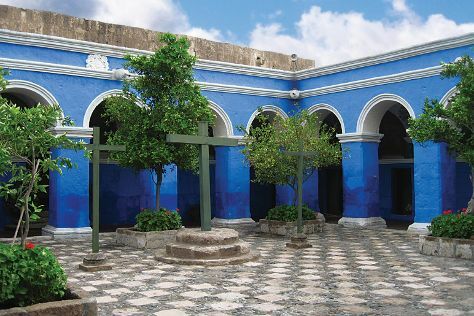 Kick off your visit on the 13th (Wed): examine the collection at Monasterio de Santa Catalina, then identify plant and animal life at Santuario Nacional Lagunas de Mejia, then admire the landmark architecture of Plaza de Armas, and finally take an in-depth tour of Museo Santuarios Andinos. To see traveler tips, reviews, where to stay, and tourist information, go to the Arequipa tour itinerary maker site . You can fly from Cusco to Arequipa in 1.5 hours. Other options are to drive; or take a bus. Expect a daytime high around 67°F in March, and nighttime lows around 51°F. Finish up your sightseeing early on the 13th (Wed) so you can travel to Lima. On the 14th (Thu), admire the striking features of Palacio de la Union, then tour the pleasant surroundings at Playa Kon-Tiki, and then kick back and relax at Playa Penascal. Keep things going the next day: get a sense of history and politics at Palacio de Torre Tagle, take an in-depth tour of Museo Larco, wander the streets of Miraflores, then stroll through Circuito Magico Del Agua, and finally ponder the design of Plaza de Armas (Plaza Mayor). For ratings, where to stay, maps, and more tourist information, refer to the Lima trip planner . Traveling by flight from Arequipa to Lima takes 2 hours. Alternatively, you can drive; or take a bus. Traveling from Arequipa in March, expect Lima to be somewhat warmer, temps between 81°F and 69°F. Cap off your sightseeing on the 15th (Fri) early enough to travel back home.